proven solutions & lifetime warranty. Give that Nasty Crawl Space the Boot! patented products and 25-year warranty. with our radon testing & mitigation services. Ohio Basement Systems is Northern Ohio's go-to basement & foundation contractor. We are licensed in basement waterproofing, foundation repair, crawl space repair, concrete leveling, concrete sealing, and basement finishing. Rather than try and be a jack of all trades, we focus on a handful of select home services. This focus and our dedication to quality work has made us Northern Ohio's below-grade experts. We started our family-owned and operated company back in 1999. Since then we have provided permanent solutions for hundreds of homeowners dealing with basement leaks, unfinished basements, foundation settling, moldy crawl spaces and sunken concrete. If you live in Akron, Cleveland, Youngstown or surrounding areas give us a call today at 1-855-55-BASEMENT or click below for a free estimate! Basement WaterproofingWe have the most effective solutions for wet basements. Foundation RepairWe'll find the right solution for your foundation problems. Crawl Space RepairWe offer complete crawl space encapsulation & repair services. Basement FinishingWe transform your basement into a comfortable living space. Sump Pump InstallationOur sump pump systems are engineered to get water out. "very quick and neat work. 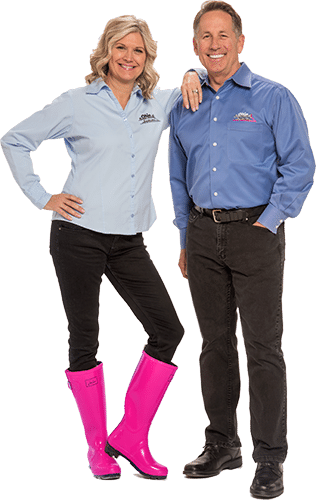 Just what we were hoping for in..."
We are members of the Better Business Bureau, Homebuilders Association, and BNI Group.Our employees receive extensive training and certification as waterproofing professionals. The waterproofing and foundation repair products we use are patented and warrantied. We only provide permanent solutions that last the lifetime of your home. Along with the quality of our work we focus on the quality of our service. This means you receive straight answers instead of sales pitches. You have all your questions answered. You get the promised work completed on schedule. You only pay for what was agreed upon and your home is treated with respect.